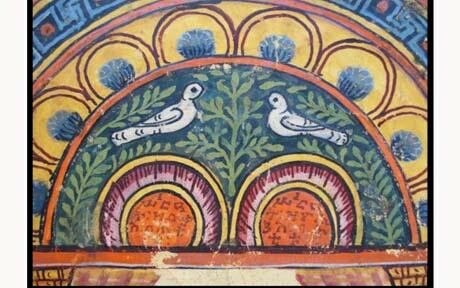 A manuscript found in a remote Ethiopian monastery could be the oldest illustrated Christian work in the world, experts have claimed. Originally thought to be from around the 11th century, new carbon dating techniques place the Garima Gospels between 330 and 650 AD. The 1,600 year-old texts are named after a monk, Abba Garima, who arrived in Ethiopia in the fifth century. According to legend, he copied out the Gospels in just one day after founding the Garima Monastery, near Adwa in the north of the country. The vividly illustrated pages have been conserved by the Ethiopian Heritage Fund and it is hoped that the two volumes will be made available to visitors to the monastery which is in discussions to start a museum there. Illustrations of the saints Matthew, Mark, Luke and John are all included in the book along with what may be the first ever Christian illustration of a building, the Temple of the Jews. The Garima Gospels, which are believed to have magical powers, have never left the monastery. They were written on goat skin in the early Ethiopian language of Ge'ez and are thought to be the earliest example of book binding still attached to the original pages. The earlier date given to the manuscripts coincides with Abba (Father) Garima's arrival in Ethiopia from Constantinople in 494 AD adding weight to the legend that he was responsible, at least in part, for writing the texts. Mark Winstanley, who helped to carry out the conservation, said: "The monks believe that the book has the magical powers of a holy text. If someone is ill they are read passages from the book and it is thought to give them strength. Although the monks have always believed in the legend of Abba Garima the new date means it could actually be true."